(#1) Athletes peaking at the right time: India has never been better prepared going into an event such as the Asian Games 2018. Barring a few instances in athlete selection and scheduling trials, things have progressed rather smoothly this time. Indian athletes have received all the systemic support and facilitation from the authorities in terms of international training, coaching and competition exposure and therefore seem to be peaking at the right time. For example, in the very recent past, Indian Boxers won 4 medals at Chemistry Cup Germany and Ulaanbaatar Cup, Mongolia. PV Sindhu won a silver medal at the Badminton World Championships, China. Jinson Johnson smashed a 42-year-old, 800m National Record. Hima Das won gold at the World U20 Championships in Finland and Neeraj Chopra won gold at Sotteville Athletics Meet in France. There are many other recent examples from other sports. (#2) Synergized and coordinated facilitation: The Sports Ministry, the Indian Olympic Association and the Sports Federations have synergized efforts and the timely intervention from the Sports Minister has resolved issues from time to time. (#3) Growing interest in sports beyond cricket: General awareness and interest in sports beyond cricket is at an all-time high while the level of support and encouragement reflected for non-cricket sports through social media mentions and impressions is encouraging to say the least. This time, all of India is waiting with bated breath and a sense of excitement to watch India compete at the Asiads 2018. (#4) Emerging non-cricket stars: Today, India recognizes athletes across sports such as Hima Das, Dutee Chand, Mohammed Anas, Jinson Johnson, Arpinder Singh, G Lakshmanan, Rani Rampal, Lalremsiami, Gaurav Solanki, Mohammed Hussamuddin, Neeraj Chopra, Mirabai Chanu, Anish Bhanwala, Vinesh Phogat, Karman Kaur Thandi, Ankita Raina and many more. All these emerging athletes are key medal hopefuls at the Asian Games 2018. (#5) Growing breed of world-class performers: In addition, we have a whole battery of prominent athletes competing at the Asian Games 2018 including Bajrang Punia, Sushil Kumar, Seema Punia, Sakshi Malik, PV Sindhu, Manika Batra, Sharath Kamal, Saina Nehwal, PV Sindhu, Jitu Rai, Heena Sidhu, Deepika Kumari, Vikas Krishan, Tintu Luka, Yogeshwar Dutt, Saurav Ghoshal, Joshna Chinappa and Dipika Pallikal. In most cases, these athletes are India's best medal prospects. (#6) Holistic athlete development: Over the years, Indian athletes have understood that winning takes a lot more than technical skill and fitness. And therefore their holistic preparation today includes focussing on mental conditioning, psychology, sports mechanics, nutrition, lifestyle, etc. And this approach has started to deliver medals which in turn has built confidence and self-belief. India is ready to perform and deliver on big sports stages such as the Asian Games 2018. Not only will the Indian contingent win big, India will also record its highest sports event viewership at Jakarta Palembang 2018. Ever since CWG 2018, there is a high level of interest and a mass movement in following live sports on television. #1. Feature at 4th or 5th position on the final medals tally. 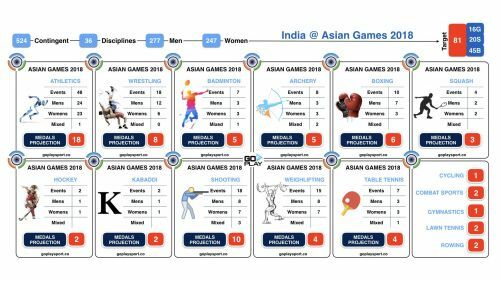 Over the last three editions of the Asian Games, India's largest proportion of medals has come from five Traditional Strengths - Athletics, Wrestling, Boxing, Shooting, Kabaddi. This is where the majority of medals will come from this time as well. 5 Emerging Strengths include Badminton, Table Tennis, Squash, Weightlifting and Hockey. 3 Developing Strengths where India could spring a few surprises include Archery, Cycling and Lawn Tennis. 3 Outside Surprise Springers would include Rowing, Gymnastics and Combat Sports. India's journey towards emerging as a dominant sporting nation has begun. Results at the Asian Games 2018 will make all of India proud. All that the team needs is love, encouragement, support and motivation from the rest of us. So make a big effort to support team India. Here are a few things that each of us can do to support Team India at the Asian Games 2018. Adopt a pin - from the options here and use it to support Team India. Adopt an athlete - Follow your favourite athletes on Social Media Channels (Twitter, FB, etc) and send out encouraging messages to show your support. 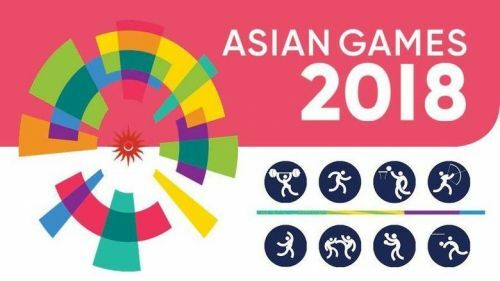 Follow sports updates - on Asian Games 2018 on your preferred platform, whatever that may be.